We woke up monday morning in SF and were very excited to be heading to Vegas, you read about it, see it in the biggest movies, but until you experience it, you don't realise how surreal it is!? We touched down, grabbed our bags and hopped onto a 'Showtime' shuttle bus to our hotel. We were staying at The Excalibur, right on the strip between the Luxor and NewYork, NewYork. The location was brilliant as everything was literally on our doorstep! We checked in and hit the Strip to explore, we wandered through our hotel lobby first to get our bearings and check out the pool (sweet! ), the Hotels in Vegas are HUGE!! Their lobbys have actual cities of restaurants, shops, bars and casinos in them-its unreal!! We explored Excalibur, NewYork and MGM (where there was a Lion enclosure?!) then our bellies started to rumble so we grabbed some dinner and freshed up with a glass of wine (por moi!) and a cold brewski for Adam!Its amazing just looking down the strip with the lights all shiny and lit up and taking it all in! 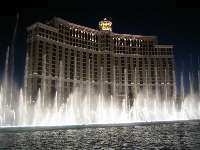 We then hit the town checking out the hotels as we walked, we made it up to the Bellagio just in time for the water show. Basically, every half hour, the hotel plays a song and the water fountains which it has in the massive lake in front of hotel go off in time to the music-we loved it! I'd def like that water feature in my back garden!! We ended up in an Irish bar (of all places!) in New York New York and stayed there til 4am that night! They had a great Irish band playing in there and we threw a couple of song requests at them, it was fab! We also met the most adorable old Asian lady ever, she goes to this Irish pub every night (except wednesday as this band doesnt play) since her hubby passed away and she knew all the songs and danced the night away! We were knackered after all the singing and dancing, and Adam was alittle worse for wear so we went back to Excalibur and fell into bed! Next morning, after a nice loooong lie in and Pizza Hut for brunch we grabbed our bikini (Adam, his shorts) and towels and headed to the pool for a sunbathe and dip in the pool. The pool area was lush with three pools and hundreds of loungers, temp was mid 30s so we baked for a couple hours, freshened up and headed down the strip again to check out all the other Hotels. We ate at a lush BBQ restaurant in Planet Hollywood hotel that night and were fit to burst after that! Back to the hotel again and we checked out the Luxor and Madalay Bay that night, Manalay Bay was gorge inside, very swanky and the Luxor was amazing as the hotel is basically a pyramid! They all had Cocktail stands where you could buy frozen cocktails and bring your empty cup back for cheap refills-loved that idea and the cocktails were tres yummy!! Its so weird to just see everyone wandering the streets and through hotels with bottles of beer or massive cocktails in there hand as you don't see that at home usually.. you could but one beer/drink at a bar/ shop and wander to another bar/ hotel with that drink! Next morning we wandered up to the North of the Strip, wandered through Paris, Ballys, Bellagio, Caesars, Venitian, Palazzo and Treasure Island. Each hotel is gorgeous and the decor inside matches the theme of that hotel. The Venitian has an italian theme and has a lake with gondolas outside and an indoor shopping area with a painted italian sky and cobbles, lush! Caesars Palace is great aswell and it features in the funny movie The Hangover so it was fab to see inside it! We would def like to stay here someday!! Back to the hotel then again to freshen up and hit the cocktails! We played alittle Roulette in Ballys and Casino War (which we loved! Each player gets a card and as long as you beat the dealer's card you win your bet!) We didnt lose any money which is good and won enough to pay for our lunch, on our last day Thursday! 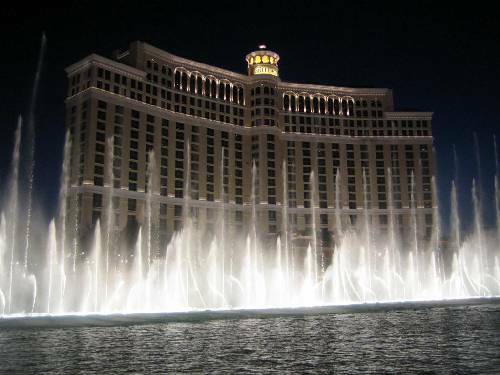 Our last day we took it easy, strolled along the Strip, watched another of the Bellagios water shows-during the day, the show is every hour but two songs are played in a row and we had the American athem and 'Time to say goodbye' by Andrea Bocelli, they were excellent!! Wandered back to hotel to get our shuttle and waved goodbye to Vegas, but we will definately meet again soon as both Adam and i loved it and want to go back! !